I reached out to Rich to ask when the idea for an American-only format took form. “It was not in the works before I arrived,” Rich replied via email. “In my second week here, I challenged our staff to come up with a strategy to better leverage our investment in elite athletes. Focusing on our commitment to the men’s and women’s USA Championships is where we came down. The idea of promoting homegrown stars in a USA Champs title race on the 4th of the July just feels right. 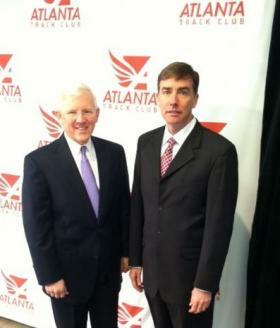 Rich Kenah, (r) the new Executive Director of the Atlanta Track Club, with Bill Duffey, the club’s Chairman of the Board. 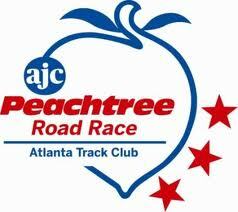 This February 5th, the 50 year-old Atlanta Track Club announced the hiring of the 43 year-old New Jersey native and Georgetown grad as their new executive director. A two-time World Championships bronze medalist at 800 meters, Rich came to Atlanta via Boston-based Global Athletics & Marketing where he had worked since retiring from competitive racing in 2000. At GAM Rich helped manage athletes like Olympic champions Tirunesh Dibaba and Meseret Defar of Ethiopia, and Jenn Suhr and Aries Merritt of the USA. As VP of Marketing, Kenah also assisted in staging international track meets like the New Balance Indoor Grand Prix in Boston and the outdoor Adidas Grand Prix in New York City. “Two years ago Aries Merritt was one of the break-out athletes from the London Olympics,” said Rich in an interview I conducted in February in Boston. “He won the gold medal in the 110 meter hurdles and set the world record. He was from Marietta, Georgia, just outside Atlanta, and said he wanted to go back home and share his medal with people. Kenah, who is married to former middle distance stand-out Cheri (nee Goddard) with whom he has 10 year-old twins, remembers his own start in running, and connects the dots from there. one of the sports best gentleman…as always, great stuff Toni.